Bitcoin is a Protocol. Currency is Its First Killer App. A couple of weeks ago I jumped into the Bitcoin bandwagon. As soon as I hit “publish” on my blog the demons of fiat money and central banking casted an evil spell and crashed the value of Bitcoin. Way to go, China! My timing sucked. Although I did some dollar cost-averaging by buying Bitcoins whenever (I think) the value goes down, I’m still down by about 25%. My break even point right now is at $857. Having said that, I don’t regret going into Bitcoin. I did my homework before I took the plunge. I’m aware of the risks and hyper volatility of this unprecedented global IPO. I’m aware that it’s a bet. It’s a bet against the Powers That Be (i.e. nation states, central banks). I’m prepared to lose everything I put in. Yes, it will sting a bit. But I’m still bullish on Bitcoin because I’m convinced that its technical fundamentals are strong — peer-to-peer open source cryptography driven by democratic anti-authoritarian idealogy. An idea whose time has come. You see, the main reason I went into Bitcoin is not just to make money. The disruptive power and the ideals behind it are what convinced me that it’s worth it to have a skin in the game. I owe this newfound fervor to none other than Bitcoin purist and uber-evangelist, Andreas Antonopoulos. He’s the one who pushed me over the edge into the Bitcoin rabbit hole. And I thank him for that. 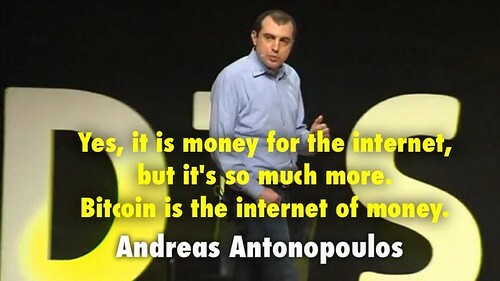 If you don’t know who Andreas Antonopoulos is, do yourself a favor. Watch this talk. This is the TED Talk of Bitcoin. No fancy Powerpoint slides required. So whenever I feel sucked in to the wild volatility of Bitcoin, I just repeat this mantra to myself: Bitcoin is a protocol, a protocol, a protocol, a multi-trillion dollar protocol. Some say that Bitcoin is the “currency of the resistance.” If you feel compelled and excited to heed Antonopoulos’s clarion call, then you, my friend, are the resistance. And when everything is said and done and if the Bitcoin grand experiment fail, then everything will still be alright. I put my money and time where my heart is. I joined the chorus of the geeky evangelists who toiled day and night to make a better and just global society. That feeling is priceless. Crash and burn! It’s Bitcoin or bust from here on end. Grеat blog here! Also youjr site loads up fast! a lot of it is popping it up all over the web without my permission. Do you know any solutions to help protect against content from being ripped off? Nice replies in return of this difficulty with real arguments and telling all about that. Hello my family member! I want to say that this post is awesome, great written and include approximately all significant infos. This was posted by c4chaos on Monday, December 23rd, 2013 at 12:00 am. Bookmark the permalink.